I was prepared for the year to end. I knew it was coming, I know what's next after Christmas, but I have no idea how the end of a DECADE slipped up on us! It seems like I should be taking a much more careful look at this year, and the nine that came before it before I turn this page! I can't believe how fast ten years have passed, and I can't imagine what will happen over the next ten years, minus the obvious aging that will occur. So much has changed in just ten years, and so much has remained the same. I want to say that down deep, if you sat down with me ten years ago, or today you'd recognize me. My humor is the same, my temperament has hopefully only changed for the better (this will be a lifelong process), though it's still a part of me-lots of opinions, big passion for each. I have many of the same friends, with additions to that, as it should be. I've lost my one and only Grandparent I've ever know at the beginning of this decade, and yet his impact has remained so completely that it doesn't feel like nine years have passed since I hugged him last, and saw him smile. I miss him dearly, but know that he is in a better place. I finished up my degree from Baylor at the start of this decade, and the following year, I earned my masters from Texas A&M Commerce. I began my first teaching position in a very difficult school, and packed a lifetime into those two years. 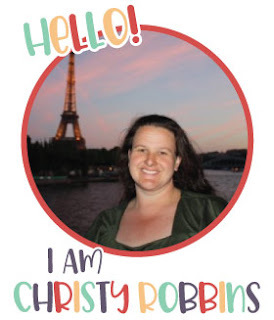 I taught 6th grade for 6 years before transitioning into a position as a reading specialist, which has filled the last three years of this decade. Through those experiences I've learned a lot about the world, for better, and for worse. I know the range of parents that are out there, and I cling tightly to the wonderful childhood I was given, despite the trials that were thrown our way, and it impacts me more now than those years I 'lived it'. I now know how well my Mom dealt with it all because of what I've seen throughout this last decade. I've seen people that encountered a lot less, and did a lot worse with those situations, and that has taught me not to accept excuses, but to work through their reasons. I've said goodbye to pets I've loved, and brought three new little furry friends into my life that wag hello everytime I come home. I've learned a lot about what I don't want to be, who I don't want to be with, and where I don't want to go. I've watched love bloom, I've been a part of really wonderful weddings, and births. I've been there for divorces, and loses as well, and we've all grown from the experiences. I'm a slightly better cook-I've progressed from the microwave. 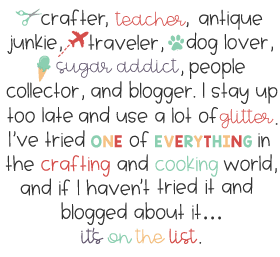 I'm a more selective friend (for the better), and a more knowledgeable crafter. I've bought a house, paid off a car, traveled to almost all the states, and traveled through three continents. I've lost an organ, I found a church home. My Mom battled breast cancer...twice, and won, and we walked through all the surgeries that came with that and the hysterectomy that followed as a team. My back aches a little more than it did ten years ago when I get up in the morning. I've survived another ten years as Jason's sister, and I understand him a little better, and know he loves me, and more importantly, that he loves God. I've chased gray hairs in the last five years I can't even comprehend. My cousin, Holly and I have transformed our cousinship into a close friendship, and she's become the little sister I always wanted. I've said sad goodbyes to friends, and had doors slammed in my face, and windows opened I didn't even know existed. I've conquered a decade full of to do lists, and failed at just as many personal goals, and yet, I'll make another list this new year, and just about every week from here on through the next decade. I've had people I thought were unshakable shake me to the core with their choices, and their absense in times I thought they would have been there first, and been surprised by the dedication of some friends, and their steadfast care, concern, and love. 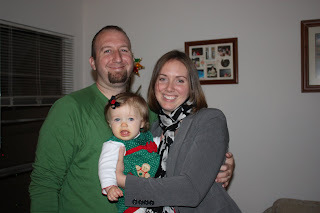 This decade ends with a most precious promise in the form of one little bundle of Blythe. I can see through it all that God is in control, He loves me, wants whats best for me, and has provided all the strength I need in the times that I would have wished a different course. He's never disappointed me, or failed to meet my expectations, or forgotten a promise. I don't know what the next decade will bring, but I know it will be blessed with God as my guide, and the friends by my side that He blessed me with this past decade, and beyond. Tonight the family came over one more time. 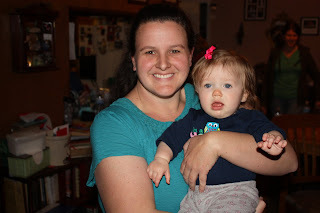 We ate dinner, and Blythe, Lydia, and I did a little crafting (to be features MUCH later). Blythe does not love crafts as much as I do...yet, but give us a few more years. The results are the best we all could do with a struggling 7 month old, but that's just part of the experience, and the memory! She loves plastic spoons, and this is how Mom and Dad survive dinners out. I took a little video to remember some of those sweet sounds she makes. I know she will be completely 'new' the next time we see her. This trip she learned to crawl, graced us with the cutest little waves everytime someone picked her up, walked around with her, left the room, looked at her funny, etc. She also made precious sounds, chewed on everything she could grab, and experienced her first snow, AND was a part of all of our first white Christmas. It was so good to have the whole family together this Christmas, and I'll treasure these memories forever. If you knew about this, and didn't tell me....I'm mad at you! ;o) Someone brought this caramel sauce with apples to a Christmas party I attended this year. I love caramel everything. When I found out how easy this was, I had to make my own. I put it out at Christmas, and I have plans for a banana pie someone told me about...soon. Anyway, back to making caramel. All it is a can of sweet and condenced milk (so make this BEFORE New Year's diets begin). You leave it closed in the can, put it in a pot of water, and boil it for 3 hours. As the water boils down, you'll need to add more water so the can stays completely submerged. After three hours, take it out of the water, and put it in the fridge for 24 hours until you are ready to serve. It was sooooo good with sliced apples. The lady who brought this mixed in chopped nuts. I knew I loved these shoes, but did you know the ribbons tying them on can also double as a tasty treat? Pretty much everything is edible to Blythe, but...Super cute, and super yummy, does life get any better? Remember these? 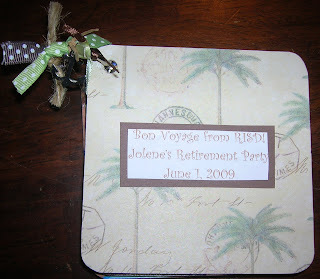 I made this little coaster book for Kelly. She is IMPOSSIBLE to shop for, and I'm tired of buying her frogs. I also made her one of the mugs (like I made Jimmy), but I didn't think she appreciate pictures of Blythe (though it was hard for me to wrap my mind around, because who wouldn't want to see that cute little button when they are drinking coffee? ), so I decided to fill it with Vegas pictures. Here are two of the three sides (you get the idea, the third side was blurry). I also made a cup for my brother from this summer's trip, but....at the risk of being redundant, oh, and to avoid unwrapping it b/c I forgot to get a picture....you'll have to imagine it-lots of NM/AZ/CA pictures, all rated G-for Good Times. I also made this gift for my pal, Jolene. She retired this year, and we hosted her retirement this past spring. It's just a little something, but I just love these little coaster books! I did not do a good job about photographing all the things I made b/c by the time I'm done making things, sometimes I'm so sick of looking at them, I wrap them up to get them out of my sight, and out of my thoughts. 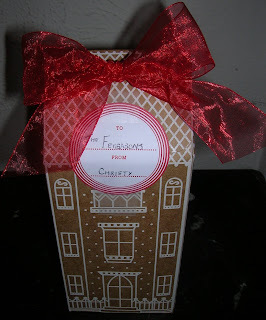 I'm determined to document gifts better so I don't end up making 'more of the same' for someone in future years! 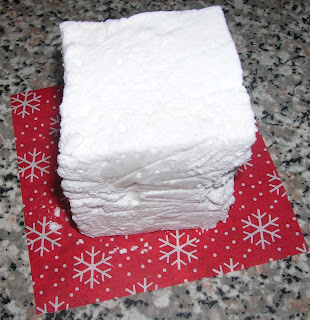 On the First Day of Christmas, I'm Dreaming of a White Christmas! Christmas Day we woke up to snow, snow, SNOW! It was so exciting. We usually get ice, and rarely see clear sidewalks, and white lawns. You certainly can't work with ice in regards to sculpting funness out in the yard. This year, after opening gifts in the morning, and eating breakfast, I went out and made a minature snowman. 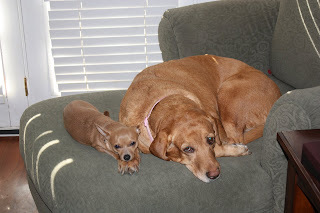 Lilly didn't let this little guy last long. Mom and I finished up the lunch, and the Mariams came over for dinner, and gifts. Blythe has conquered gift unwrapping, but she's more into the paper, than the gifts at this age. She also wore her new shoes I made, but....again, she spent more time chewing on the ribbon, but hey, whatever makes her happy is cool with me! That evening the girls drove around and looked at Christmas lights. It was a really peaceful day, and just how I wanted it to be, and....my very first white Christmas! This is actually Jimmy's Birthday gift (December 18th). It took me forever to find the cup I wanted to use....but finally, I found one at Starbucks I really liked b/c it is so sturdy. He's part of our family, so he'll fill it with Dr. Pepper and not coffee, but....I thought it might be fun to have a personalized mug. Plus, again, I'm struggling with the 'boy gift ideas.' These mugs are pretty cool, you just unscrew the bottom, and there's a template for the size that fits inside. I found (all) the pictures of Blythe, Lydia, and Jimmy I could on their facebook accounts, (nothing like stealing some photographs). I shrunk them down, printed them, and then glued them down to the paper template. Pretty simple idea. Fun gift. Blythe had to make a gift for her dad, but....I don't want her to have anymore emotional scars from random craft projects, paint, or glitter. I knew I wanted to make a coaster for Jimmy (it was harder to think of something for a guy). He likes to drink DP, so I figured a drink is never very far, and this would be a good gift. I went back and forth on the best way to make a coaster....I thought about getting glass and hodge podging the picture to the bottom, sealing it etc, but the craft stores had really thin glass. I hoped to find tile at the home improvement store....again, no luck. After at least 8 stores, and buying random things I THOUGHT might work that I won't waste time on, I found a magnetic frame at JoAnne's that worked so much better than any of those could have. I also tried out some various 'crafty' things for the inside photo, but I will have to wait until another gift some other year b/c, again, I couldn't get it right, so I used this classic picture of father/daughter. Jimmy can appreciate the humor in the photo. I sealed the top, and then super-glued felt to the bottom, and attached four, clear circles (used for keeping craft rulers from sliding around when you cut fabric) so it won't slide around. I've seen this idea all over the internet the last few years, and I've been itching to find someone little to create one of these. When Blythe was born, my plot began. We went to visit her when she was 3 months old, and I brought along a little bottle of lavender paint. Sure, most babies might not begin their craft projects this early, but...she is a pretty special baby, so I felt she was up for the job. I enlisted the help of her Dad. Since Lydia was around the entire time we were visiting (which I'm happy for), I left Jimmy with the instructions to smear paint all over his daughter's hand, place that painted hand on a piece of paper, and scan the handprint to me so I could complete this project. Jimmy has been my cousin for as many years as he's been anyone's anything, so he also didn't blink an eye at this request. He's a real trooper. 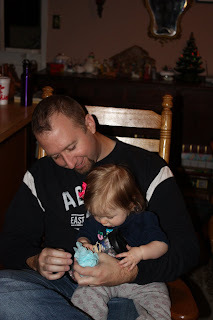 As soon as we left California, the fires swept through, and Blythe went to visit her IL family, so it was at five months that Jimmy was able to sneak in some crafting with Blythe. He said she was very wiggly, and her very favorite thing are her hands, so getting her to not lick the paint was a bit of a trial, but he sure did a good job with these crafting handicaps! He scanned the photo, and I printed out a 'thumbnail' size picture of the hand. (Most of the pendants I've seen, people have taken their kid's artwork, colored/painted pictures etc, scanned, and printed out a thumbnail print, and completed this same project for grandparents, etc, sooooo cute, but I didn't think Blythe was quite ready for the crayon.) I ordered scrabble tiles online (which means I only have 99 more, time to reorder?) I selected the B scrabble piece (3 points), of course, for this project. I spread hodge podge glue across the blank side, set the thumbnail print on top, and spread another layer of hodge podge over the print (it looks 'white,' but dries clear). When it dried, I bought a finding at the craft store. I glued the finding to the letter side with super glue so that it can be worn as a pendant. Blythe's 5-Month handprint will live on forever, and she has now completed her first craft project. 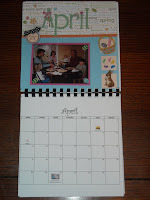 This idea was borrowed from...I adapted this idea from a friend of a friend that I scrapbooked with a few times. 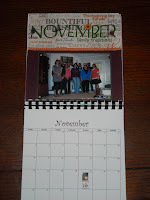 She makes a calendar every year for her family to document their events from the previous year. 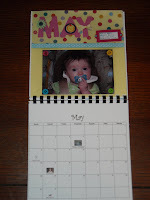 I thought this would be a cute idea for family's with kiddos/for the Grandparents/Aunts/Uncles etc, but for now....I was doing good to come up with a picture for each month over the last 30 years! Who got it? 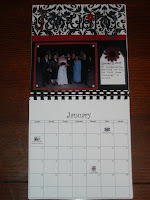 I made one of these calendars for my Mom, Aunt, and Cousin (so most of the family's have one). *I typed up all the dates for the coming year on word, including holidays, and birthdays (including a picture, in case those far away forget what we all look like ;o)). 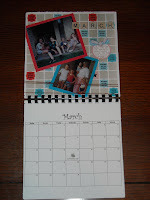 *I then bought an 8x8 scrapbook album (I kept the originals, again, this would be really great if you were making it for the kids so you have a little page to show for each month for every year). In my case I tried to find pictures that would mean something to the entire family, and color copied the photos, created a layout, and wrote up a little synopsis of why this was something that was meaningful to the family. 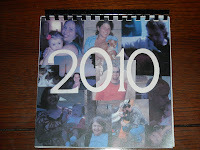 -The cover included the new year, and pictures of each family member from the past year. -January=The whole family at Jimmy, and Lydia's wedding in IL a few years back, there is nothing quite as wonderful as gaining a new family member! -February=A Mother's Love included a picture of all the cousins with our two Moms, and the newest Mom-Lydia, and Blythe (I couldn't do this in May because it had something really special in store for that month). -March=Trips to Freeport to visit the Mariam's Grandparents. We used to go at all times throughout the year, but often around Easter (in the spring), and again in the summer. Jason and I were lucky enough to get to spend time on the farm as well getting to know this side of the Mariam family. -April=Easter. I found a picture of 'our' Granddad eating a holiday meal with us when we were little. He never missed a special occasion, and all the holidays bring back those memories of all the years we have been together to celebrate. 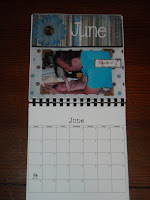 -June=Happy Father's Day to the family's newest dad! 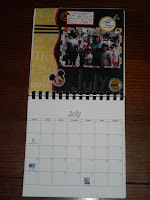 -July=One summer the whole family went to Disney World together-it was the most Magical Trip! -August=Trips to Lake Murray, OK. Again, we visited at all times of the year, but usually around Labor Day. I loved that place! I found pictures from all the cousin's early days. 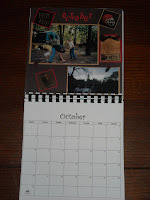 -October=Camping Trips, and Football games between the boys, and Baylor football attendances amongst the family's Bears! -December=There is so much joy when Christmas rolls around because of the people I get to spend it with! 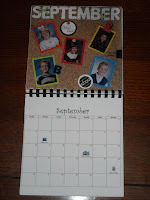 *Next, I took the scrapbook pages, and color copied them at Kinkos on Cardstock (about a dollar a page). 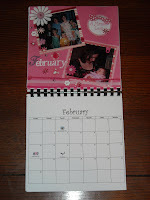 I then took the calendar pages I had printed on cardstock, and I had both sides bound so it would open like a calendar. 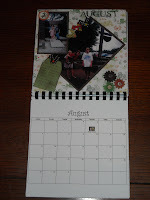 The pages you see are the Kinko's copied versions...I'm always amazed at how well you can copy scrapbook elements! Here it is, a sample of a few of the homemade Christmas gifts made over this past year in anticipate of my first (and maybe my last) ALMOST completely homemade Christmas. I need to start thinking about next year now b/c it was a stressfree way to get ready for the holidays. The problem is I'm fresh out of ideas for everyone, but Bltyhe. I've got enough gift ideas for Blythe to get her through the legal age to buy spray paint to craft her own gifts. Fasten your seatbelt for some serious posting, I have been gathering my favorite ideas to use for over a year now....and I need to document them so I can reuse them in ten years when my family, and friends forget! Wow! What a new, and different Christmas Eve! Yesterday we enjoyed the 72 degree weather with flipflops, and capris, and a rainstorm in full force. Today the temperature dropped, and some serious snow moved in! They said this is the most snow we have received on Christmas Eve/Day since they started keeping records, and it's only the 5th time it's EVER snowed here! That's pretty cool! The roads weren't too bad heading to the Christmas Eve service, but when we headed over to Holly's for our traditions family dinner, my car was sliding around, so I knew lights would be out this year. It was a little bittersweet. Finally-I'm living the White Christmas song, but it means letting go of a few Christmas traditions. As my Mom pointed out-we've done that every other year, so we will enjoy this for a change! Blythe was also the newest tradition to our little get together. She sat on her blanket, and chewed on things while we enjoyed dinner for the most part. Things have changed....for the better, and I know each year will be even more exciting with her in all our lives. It is such a sweet time to have everyone together for Christmas! 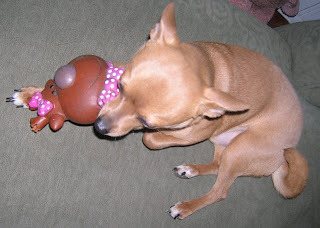 My Mom said she lost Peanut earlier. This can be a very bad thing, he has ended up in some pretty bizarre places. She tried all the 'tricks' to get him to come out from his hiding place. She finally gave up, knowing I'd be home soon to look....and then as she walked past the entry way, she discovered his latest hiding place. Too cute. Move over Max. Santa has new name on his naughty list. If you select the reindeer from the basket of four million toys you COULD have played with on Christmas Eve, and then proceed to chew it's horns off...you can probably sleep in on Christmas Morning. P.s. He's working on 2010, I just discovered he knocked over baby Jesus, and Mary in the manger scene, and then stored a sheep under my bed, his not-so-secret hiding spot. I have to share the love! One of the teachers brought this to Mary's lunch, and I HAD to have one. I would have bought it just because it's so stinking cute, but guess what, it is also wonderfully delicious. It's Challah Bread, which I love. Bread+Cuteness=Pure Joy. This little guy will be on the table at Christmas. They are currently selling these by the basketful at Whole Foods. So cute...help, can't stand the cuteness! Brian-With his trademark baseball hat, and white iphone. Holly-With her long blond hair. Jimmy-Wearing his preacher outfit, in gingerbread church land, he wears clergy collars. Lydia-With a pencil (since she's a doctoral student), and Blythe, holding a red spoon (her very favorite toy). Lois-Wearing her trademark yellow, flipflops, and walking their dog, Sandy. Christy-Long hair, in one hand I'm holding an iphone, in the other skittles. Jason-Wearing Tony Stewarts number, and his latest catch. On the Tenth Day of Christmas-Girl's Night! When Lydia first joined the family, we began going out, just us gals (Holly, Lydia,and I) when she comes into town. Usually we try out a spot around Dallas, but this go 'round I tried out a new recipe. 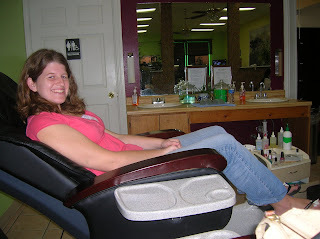 After a busy day, I picked up the gals, and our first stop, was the nail salon for pedicures, and manicures. Jimmy's actual birthday is on the 18th, but they got into town on Monday, and so we celebrated last night. I was so glad to see him, and the family after the long months apart. The very best part of me week....my reunion with Blythe. Little button nose, cutie-pie. She's filled with smiles, and a new talent-waving. I heart her! 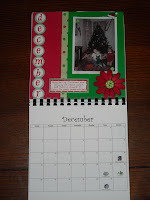 On the Seventh Day of Christmas....Scrapbooking! WHY DID I START SEEING SPRING GARDENING STUFF IN MY SCRAPBOOK STORES TWO WEEKS AGO? Hello, I'm only on day seven of my festivities, and it's just depressing me. This is where I need someone to say: "Christy, stay out of the scrapbook stores." I've been five times in the last four days, and I'm planning on going tomorrow as well. I've been several more times earlier in the week. I'm crafting, I "have" to go. So....today, I made it to the early service, which was fabulous, Pastor Graham was back in the pulpit (he's been a little under the weather), and the music was fully Christmas, yay! This afternoon I headed over to my pal Amber's house. I adore her, and she is a master scrapbooker. I learn so much from her. 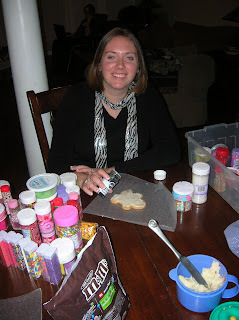 I'm going to add some pictures of a few of the crafts she is working on....b/c I can't add pictures of things I'm working on because they are gifts, and anyway, she's so talented, I had to take pictures! Anyway, we scrapbooked from 1-11, with one run to Michael's, and a dinner break. I got a lot accomplished, including an mini-album that will be a gift once I take/print pictures for it, and a few photos from my summer vacation....two years ago....I guess I'm a little behind. Whatever, I'm a little less behind than I was, so...yippee! I'll just stop taking pictures until I catch up....ha, I needed a good laugh to round out this evening! OK....back on to some projects....I can't believe how close Christmas is!!! On the Sixth Day of Christmas-Shopping! 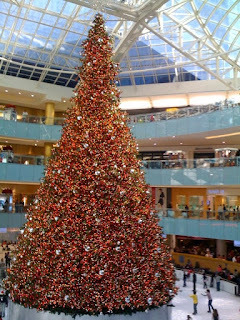 Today, Mom, Holly, Lois, and I headed out to the Galleria to see the huge tree, and decorations, and shop the shops. When I was little Mom, and Lois used to spend one whole day out shopping....and I do mean the WHOLE day. I used to think it was torture to sit around all day just waiting for them to return. Realistically, this should have been a good thing b/c it meant there would be a few more gifts under the tree Christmas morning, but really....I just thought it was super boring. Holly was too young for me to play with back then, and Jimmy and Jason were off being boys. I mean, where was CPS when I was left in these sort of conditions, you know? Perhaps the only thing MORE boring than waiting at the house for them to return from shopping was going to a department store with my Mom when I was a little girl. The only thing interesting to do was to find one of those racks that was a circle, and crawl in the middle of the choral of clothes so I was difficult to find. I still get bored at department stores if I have to stand around too long, but you'll be glad to know I don't crawl in the middle of the racks anymore, I usually go around folding their sweater displays, or organizing their displays of trinkets that have been messed up by prior browsers....surely there is a girl scout badge to be earned somewhere in these Type A Personality deeds? Today I didn't have to do much straightening up, but I did get my fill of lovely decorations. After the mall, Mom and I continued with some grocery shopping, and then we went out to Highland Park and ate at Kuby's, and then drove around some of the streets down there while we were in the area, and shopped our way home. I must say, I'm glad to finally be on this side of the shopping trips! I love this shoe pattern I bought to the third power of love. OK, tonight, after pair three, I put my sewing machine up....as if I have time for this right now, as if it's even necessary to do now, I have messages waiting to be listened to, text to return, calls to make, emails to send, a house to clean (still), and I'm STILL not done decorating for Christmas, but I do have three cute pairs of shoes that only fit one little person I know.... 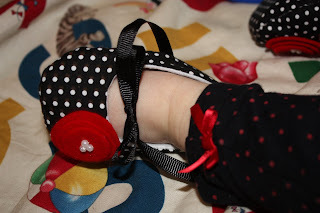 There are lots of different styles (flowers with buttons instead of the little poppies), but I just love this design...in the future....not too near future, I'll make another one with a velcro strap (...but I like bows! ), and a different accessory on the shoe, but for now....two more pairs of cuteness, a little less edgy colors, but still fun. On the Fifth Day of Christmas-Happy 30th and 5 Months! Uhhh....sure this is supposed to be about Christmas festivities, BUT really, because of the Christmas break, my friends Mary, Sonia, and I FINALLY had some time to get together. Sonia and I work together still, and Mary worked with us once upon a time, before retirement, and job changes (she mentored us both in our careers, and still does in our lives). I loved when we were the three amigos on a daily basis, but I'll take anytime with the two of them now. They took me out for my birthday tonight....I am 30 and 5 months now, so the timing was just right. We went to Benihana's Hibachi Grill via my request. It was delicious, and fun. Afterwards we headed over to a little Korean Bakery called Mozart's that has the most beautiful desserts. Most importantly we laughed, and had time to catch up in depth!